‘Until one has loved an animal a part of one’s soul remains unawakened.’ Anatole France. | Sally says . . . eat, sleep, work, read, play, draw, bark . . .
← ‘Emus live in pairs, or alone, or in groups. They mostly feed at night . . . or during the day.’ Russell Coight. Thanks Jon! Bless - he has such a sad little face . . . Brilliant sketch Sally and I know this is a philistine type question but did you run out of ink?! Not sure what you mean Judy. Do you mean because I used a biro instead of the usual india ink? If so – then no! 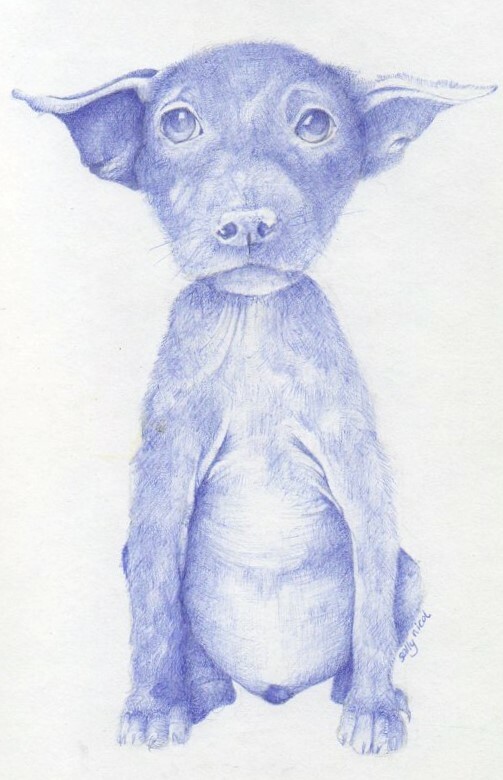 I just really like to sketch in biro, especially blue biro. I like the ‘soft’ effect it gives, and he was such a soft squishy pup . . . Sorry Sal, I meant did the biro run out of ink? I just thought it would seem like a very ‘practical’ question when your work is so ‘soft and squishy’ and more ethereal than practical! I guess I was wondering how many biros it takes to complete one beautiful sketch! Awesome sketch Sal. Is it all done with a blue pen?